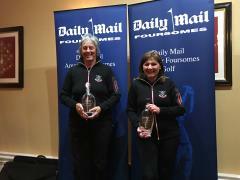 Congratulations to ALCGA member Catherine Garrett (West Kilbride) and her partner Helen Cattanach on their recent achievement in the Daily Mail Foursomes. They reached the semi-finals of the event before losing to Janice Bridgeman and Fiona Lawless from Grangemouth. A great run in the event and well done for getting as far as the semi-finals. Content belongs to Ayrshire Ladies Golf Association. Travel theme. Theme images by michaelmjc. Powered by Blogger.